The celebrated New York Times drama critic and columnist Frank Rich shares an endearing memoir of a childhood transformed by the magic of Broadway. There is a theater superstitions that if the emptied house is ever left completely dark, a ghost will take up residence. To prevent this, a single "ghost light" is left burning at center stage after the audience and all of the actors and musicians have gone home. 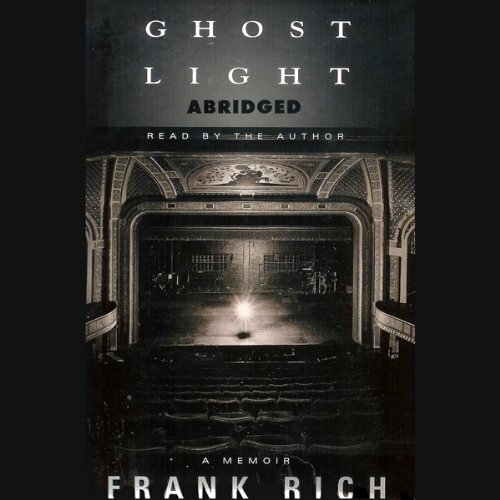 Frank Rich's eloquent and moving boyhood memoir reveals how theater itself became a ghost light and a beacon of security for a child finding his way in a tumultuous world. Struggling with his parents' divorce and the universal trial of childhood, Rich took refuge in the spectacle and emotion of the great musicals - South Pacific, Carousel, The Music Man -and eventually found a second home at Washington's National Theatre, where as a teen he was ticket-taker. The revered New York Times critic writes lovingly of how his favorite shows, songs, and actors became a lifeline, leading him out of a tumultuous household and propelling him towards the itinerant family of theater, whose romantic denizens welcomed him into the colorful fringes of Broadway during its last glamorous era.